An American “Martin Marauder” in the 584th Squadron of the 394th Bomb Group — the “Bridge Busters” — was shot down over France on this day in 1944 during mission #148. 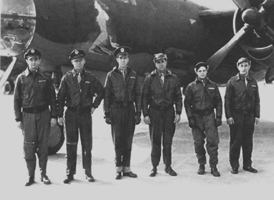 Captain Harper and his crew were flying in the lead position of the second box of the formation bombing Neuweid, Germany when their B26 received a direct hit from anti aircraft fire, burst into flames and crashed. No parachutes were observed by other crews, but Sgt Howard Mote was later reported as a POW, the rest of the crew were killed. The B-26 had a high rate of accidents in takeoff and landing until crews were trained better and the aspect ratio modified on its wings/rudder. Do you have any more photos of Ottenheimer’s crew? My Uncle Paul Stephens was shot down on the same aircraft with Stuart Ottenheimer. Please respond if you can. Hi Timothy, sorry this is all I have. I have lots of pictures of Stu Ottenheimer and the crew. My Dad was T/Sgt James Kelley that was killed that day on Nov 21 1944. Stu and my parents traveled from Barksdale together to Kellogg field before Boreham England. In touch with Harper, Harrison and Pegenos family. Would love to hear from anyone. My Mother was married to 1st Lt. Paul Stephens, Navigator with your father that fateful day. I would love to see any pictures of the crew or whatever you have. My email address is ddlischer at gmail. Thank you Kathleen Kelley Adams. My grandfather was Joseph L Hart, gunner/engineer with the 394th/584th. He would never talked or wrote memoirs about his experience before passing. I’m currently trying to research his career and wondered if you may have any photos that identify him. We would love to have copies.